Do not get all tripped up over something as minor as a Severed Leg. Actually, that is something to take notice of, whether it happens to be your own or anothers. Severed legs are not exactly all that common, and finding one is likely a bad sign. The presence of a severed leg likely indicates that something worse is likely around, be it a ferocious monster, a voracious horde of cannibalistic undead, or an unstable madman. This leg has a rather healthy and hale look, except for the fact that it has been severed just above the knee. The injury looks to be rather violent, too, given that the skin is torn unevenly and the tissue and muscles are tattered and ripped. Even the bone, which sticks out of the stump, features a jagged break that was likely as painful as it was violent. This leg is made from PVC plastic and measures approximately 24 inches long. 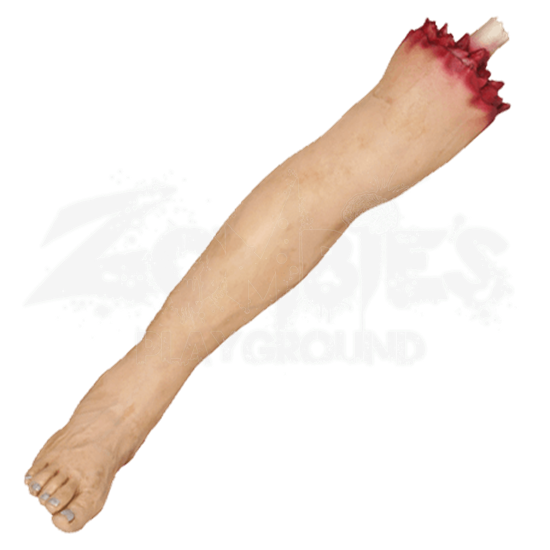 Given all the wild connotations and scenarios that could involve a Severed Leg just sitting around as decoration, this prop makes for a fantastic one whether you are catering to zombies, monsters, killers, or just horror in general!